BTST means Buy Today Sell Tomorrow, where you buy ½-1 hour before market close and sell on the next day at the earliest. 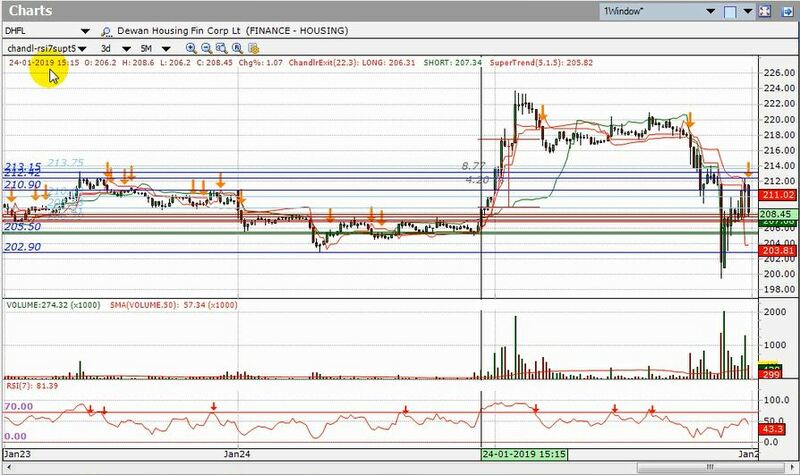 This BTST trading strategy will focus on correct entry using volume breakouts. As shown in the figure below, it can result in pretty good gains if applied properly. To find those potential entry points, lets start by enabling Auto-Support/Resistance by right-click-ing on the chart and then selecting “Enable Auto-SR”. Then select “Auto-SR Options”. Then select “Auto-SR Based on Current Cursor” so that the Auto-SR lines are dynamically drawn based on where the current cursor is (i.e. using the past 240 bars exclusive of current cursor). 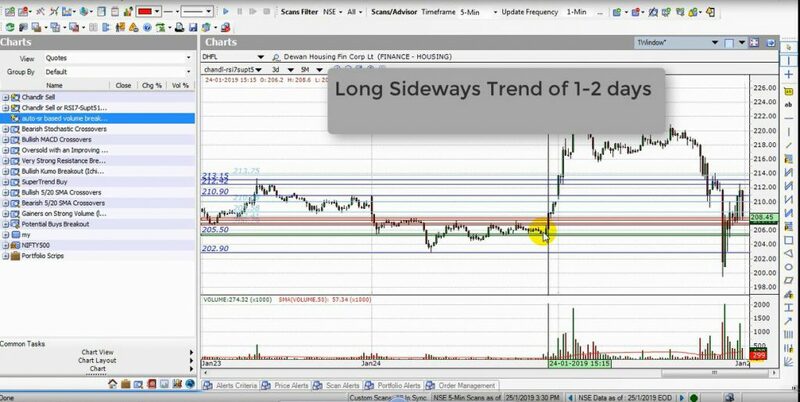 This is a great way to visually backtest Auto-Support/Resistance and related features. Also ensure that “Enable Auto-SR Zones” are enabled in this menu. As we can see in the screenshot below, DHFL did a volume breakout around 3:15 pm of a very strong Auto-Supply Zone (as shown by the red zone in the chart below), and that too on above average volume. 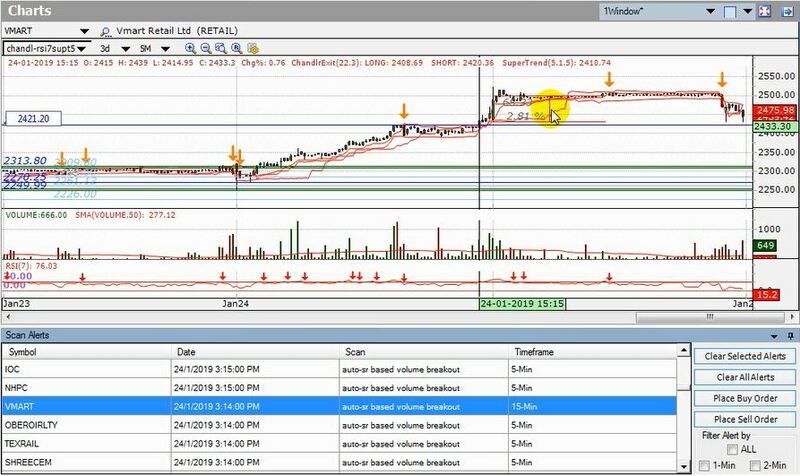 After we click on “Save” button, the orange sell signals will show up in the chart and if we were to sell it on the closing price of that signal, we would get a 4.2% gain as shown below. We can right click on any group, say NIFTY500, and right click and “Set Scan Alert”. 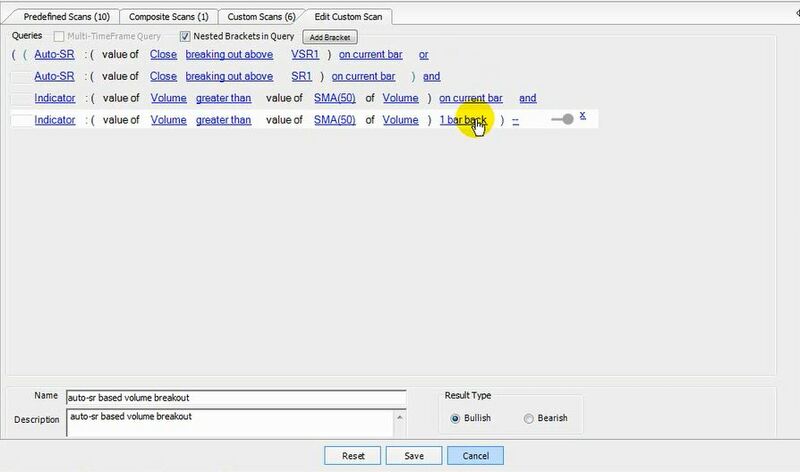 Once we do that, the scan alerts are set based on auto-sr based volume breakout scan. If we monitor the scan alerts in the software, we get pop-up and sound scan alerts as shown in the screenshot below. If we click on any symbol in the scan alert window, e.g., VMART, we can see that it captured the breakout at 3:14 pm correctly. Hope this blog post helped you to learn a BTST trading strategy with specific steps on how to select BTST stocks for BTST trading. 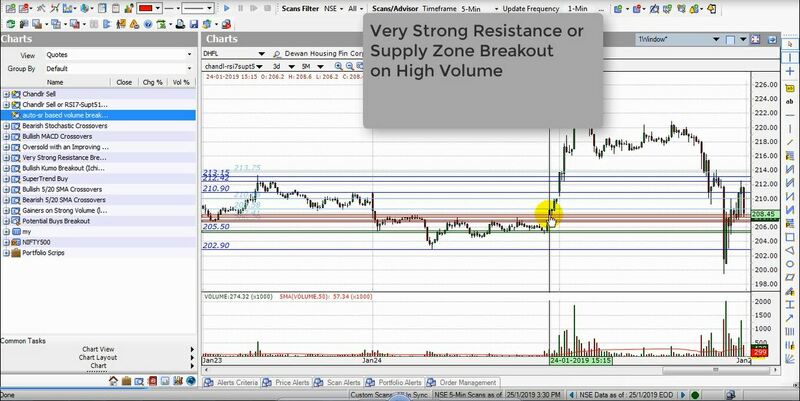 For more details, check out our video on “BTST Volume Breakout Strategy” (Watch in Hindi/Watch in English)” for an in-depth look into this topic! Want to try out this BTST trading strategy?